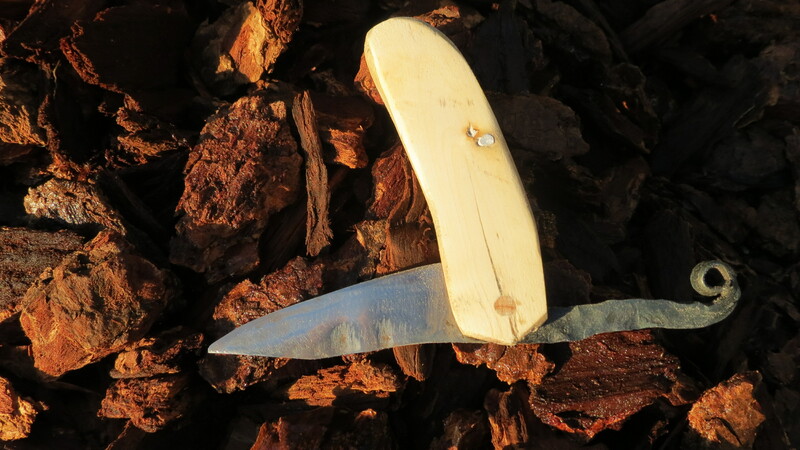 Here is my newest creation; a friction folder pocketknife. It started out as a small piece of 5160 I had cut off while trimming a larger blade (I’ll post pics when I’m done with that one). I forged it into shape, did some trimmings here and there, straightened it, then I did the curls in the friction lever by heating and curling with pliers. Once all the forging and hot work was done, I normalized twice (which basically means taking out all of the stress formed in forging, and reduces grain size), then began the rough shaping using an angle grinder. 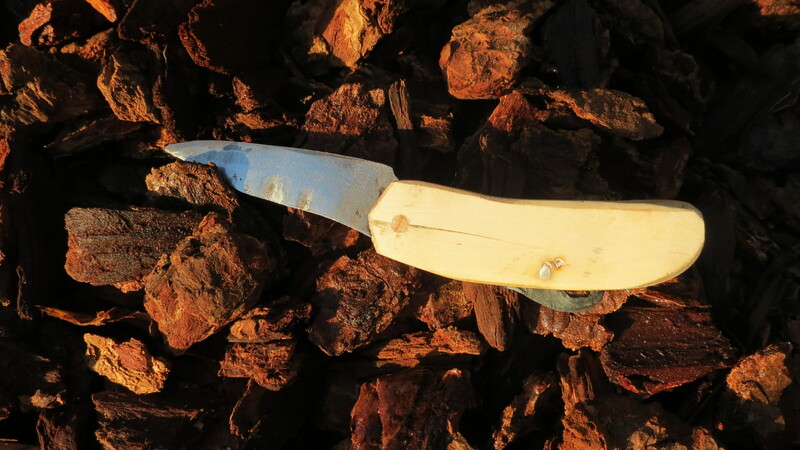 Once the shaping was done, I ground in the secondary edge and brought the whole blade nice and thin. I left the friction lever alone, however, so I could keep the rough forged look on it. I had, of course, started the process by drawing out a design to follow, which I tweaked and modified as I went through. Near the end of the forging process, I started to work on the general shape of the handle, which is made from maple wood. I would forgeforgeforge, and when I waited for the steel to heat up, I would trade off and start shaping the handle. Back to the blade, near when the handle was at its final rough shaping, I drilled a hole for the pin. Then I went on to heat treating. Just for fun, I decided to try clay hardening, which I have done a few times before. The clay I used was a simple mixture of ash, charcoal, plaster of paris (for the stickyness) and water. I covered the spine of the blade with the paste, and proceeded to heat to critical. For sake of time, I won’t go into the details of how the clay heating works, but I’ll just say that I have to heat the blade to critical temperature (the temperature the steel no longer sticks to a magnet) and then quench it in water or oil. The faster the cooling, the harder the blade. The clay slows down the cooling of the steel it covers, and so that area is much softer than the steel it does not cover. I didn’t bother tempering any further as it was a small blade and wouldn’t go under much stress (unlike some people, I don’t use knives as crowbars). 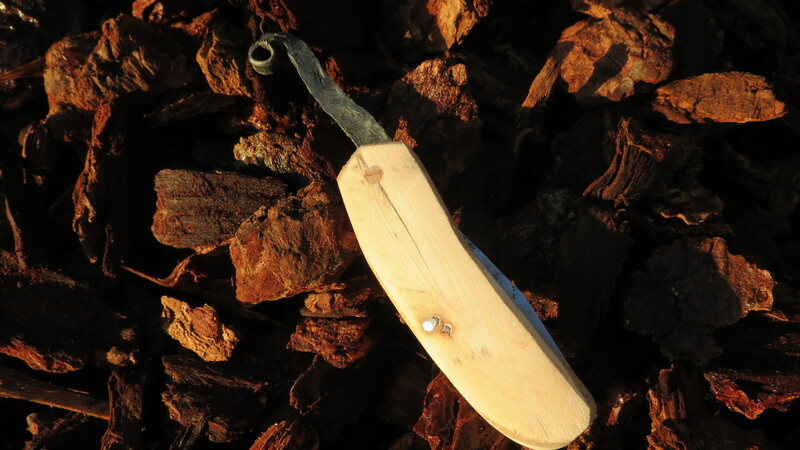 I then began cutting into the wood so the blade could be inserted, starting with the back of the handle so the lever could be inserted to a little hole. 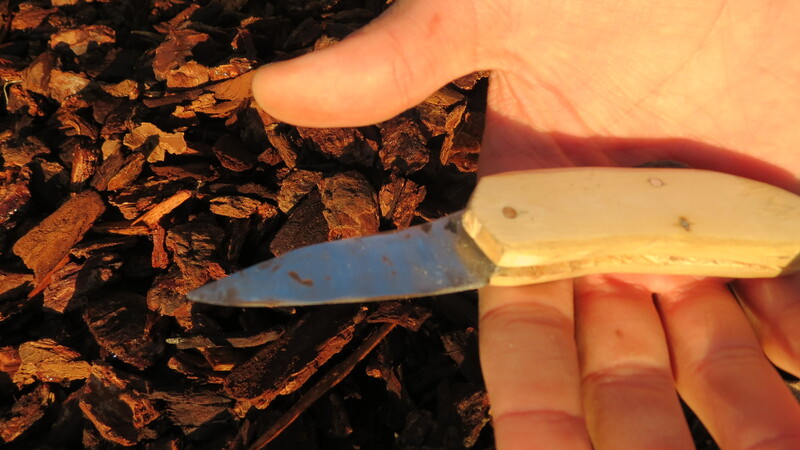 I then drilled through the wood where the blade would be held in place with a pin. 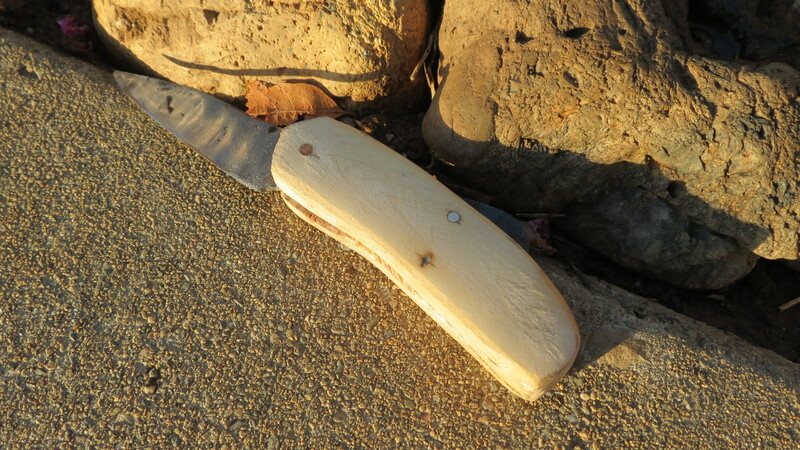 I finished all the carving, and proceeded to pin the blade in place. Unfortunately, I should have made the wood pin a little smaller, because when I pounded it in place it split the maple a little. I was able to fix that up with some elmer’s wood glue though. Once that was in place, I decided to add a little sterling silver pin further down for decoration and support. I then did a little bit of further shaping, and sanded down the maple. I also polished the blade. Unfortunately, because I was working with 5160, no Hamon showed up, despite constant rubbing with lemon juice. Anyway, I then sharpened the blade. I think I did something right in the heat treating, because I was able to sharpen this baby up enough to shave hair off my arm. Most commercial knives I can only get to slice paper. So there we go! 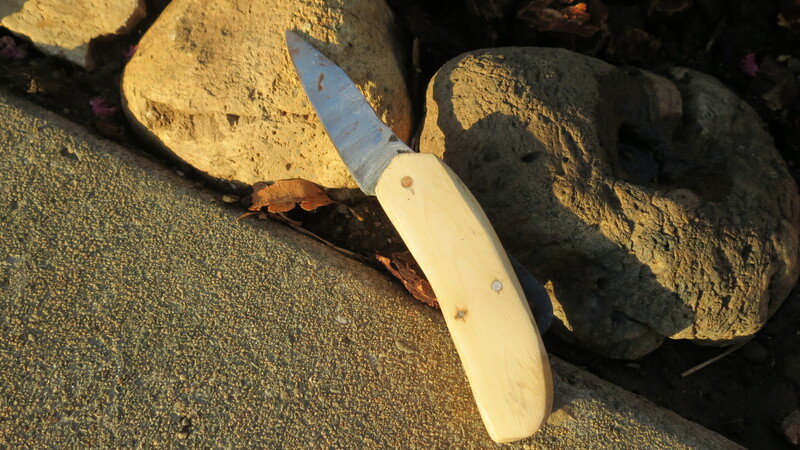 My first friction folder (so called because it stays closed or open with friction). Side note: it stays open very well because I carved a special hole for the curl of the friction lever. One has to push hard to push it in and out of the hole. This entry was posted in Uncategorized on September 11, 2013 by Captain Belaq. This one, at least, can be attatched to a keychain. But yeah, I’ll probably lose it quick too.